Sometimes when trying to decide who is going to be the Chessexpress Player of the Year, I find a player who may have done well in one half of the year, does not do so well in the other. Or that they do well in a couple of events, but badly in others. This year I am pleased to say I did not have this problem with my eventual choice. This years winner started the year with a high placing in the Australian Championships, and finished the year with as the best placed Australian player in the Australasian Masters. Along the way he became an International Master, beating Danish Champion Allan Rasmussen to score his final IM norm. He then had an impressive debut on the Australian Olympiad team, scoring an undefeated 7.5/9 on Board 5. He also won a number of important events in 2014, including the 2014 Australian Junior Championship and the George Trundle Masters in New Zealand. Based on the overall quality of his results for 2014, I am pleased to announce that IM Anton Smirnov is the 2014 Chessexpress Player of the Year. I mentioned this point a number of years ago, but the end of today's 3rd Cricket Test between Australia and India lets me mention it again. With 5 overs to play, Australia realised that they were unlikely to dismiss the last 4 Indian batsmen to win the game, and agreed to end the game early. India were obviously in no position to win (being well short of the number of runs required) although the offer went to the Umpires rather than to the other team. The ability to end games early in Cricket has been around for a while, and in a sense serves the same purpose as agreed draws in chess. In a sport where a draw is a common enough outcome, once both sides realise that a win is out of reach for both teams, then agreeing to that result is perfectly sensible. As the number of 26500+ players has increased over the years, the number of games by "Super GM 's" (to use an outdated term) has increased as well. As a result we get to see a lot more high quality games, but at the same time, there is an increased chance of seeing the absolute shocker. And as the player concerned is 2600+ this seems to magnify the size of any bad blunder, while giving a sliver of hope to the rest of us. The most recent example of this is a 10 move loss by GM Qun Ma to IM Danny Reznikov in the Groningen tournament. Failing to analyse all checks and captures, Ma missed a queen sacrifice that left Reznikov ahead material. While Ma could have played on, albeit with a big disadvantage, he decided to end the game at that point. For Ma this is probably just one game in what will be a long career, but the nature of the loss (and blog posts like this) may make it hurt for at least a little while. The 2015 Australian Open is only a few days away, and the field has just about reached the 100 mark. It is very strong at the top, with 9 GM's, 1 WGM, and 10 IM's. The organisers have done a fantastic job of attracting both players and sponsorship, with over $26000 in prizes for the Open and the Minor event. The tournament is being held at the Castle Hill RSL Club in Sydney, and starts on the 2nd of January 2015. It is an 11 round event, and finishes on the 11th January 2015. There are 2 days with double rounds, and given the strength of the field, there will be IM and GM norms on offer in the top section. If you still haven't entered the tournament (Open of Minor) you can do so at the tournament website. You will also be able to follow all the action from the tournament at the website, with live games, up to date results and I suspect a bit of social media on the side. Here is a nice attacking game from Alexander Alekhine, where he crushes former World Champion Emanuel Lasker. One interesting point from this game is how Alekhine was able to generate an attacking position after opening with the Queens Gambit. Most attacking players start with 1.e4, but Alekhine, Frank Marshal and even Kasparov felt that 1.d4 gave White better attacking chances. In this game Alekhine is on top after centralising his pieces, although Lasker should have exchanged Queens when he had the chance. By not doing so not only did he leave Alekhine with a better position, it also meant that Alekhine was able to finish the game with a queen sacrifice. One Christmas present given this year, was Quick Chess, which my wife picked up at Australian Geographic. It was a gift for our grand-nieces, who are just starting school. Quick Chess is a 2-in-1 chess game, with a learning version of the game on one side of the board, and a full version on the other. In the Quick version, the game is played on a 6x5 board (only 1 of each piece+5 pawns), and the emphasis is on learning how the pieces move. All the pieces more normally, with the exception of pawns, who only move a single square. As well there is no en-pas, no castling and pawns only promote to captured pieces. At first glance it looks like a useful way of introducing young children to chess. The smaller size of the board allows games to finish a lot quicker, and tactical ideas are more obvious. On the other hand it isn't that far removed from proper chess to make the game completely different, and the skills learnt in Quick Chess should be transferable to normal chess. I also believe some national chess federations are looking at using Quick Chess as part of a beginners coaching system, so there may be a new generation of players whose training starts on the smaller board. There are a couple of Christmas traditions that are followed in my house. One is my sons insistence on staying up late to catch the Boxing Day fixtures in the English Premier League. Another is to follow the traditional Hastings Christmas Congress. This years event starts on the 29th December and runs through to the 6th of January. The organisers are already boasting of a stronger than usual turn out this year, and the entry list seems to be filled with plenty of GM's. As is a current tradition, the top seeds come from outside the host country, but there are a few English GM's lining up to give it a go. If you wish to follow the tournament you can do so at the tournament website. The time difference between Australia and the UK may be a bit of a problem for live coverage, but I am sure by the time you wake up, the results from the days play will be available. On the night before Christmas I normally go hunting for games that are played on Christmas day, For this years effort I decided to find the earliest Christmas game in my database. I expected this to be a difficult task, as a lot of early games only have the year played, missing the day and month. Surprisingly I quickly found a game from 1837, between Von Bilguer and Von Heyderband un der Lasa. I am guessing the game is an authentic Christmas game, as it is a bit of a horror. White drops a pawn on move 6 and never gets close to equality. On the other hand Black misses a couple of crushing moves, but at least doesn't blunder back. The game ends abruptly when White moves a piece en pris. Possibly both sides enjoyed some Christmas cheer before sitting down to play, but if the quality of the moves is anything to go by, it was White who enjoyed it the most. A number of years ago I read about a variant of chess called "One check chess" (or 'first check chess') where the first player to give check wins. Apparently it did not last long as an alternative as Frank Marshall quickly found a forced win for White. Annoyingly a quick search has not turned up the winning moves, although I assume 1.Nc3 (threatening 2.Ne4 or 2.Nd5) seems to be an obvious start. One possible improvement is 'Safe check chess' where the first player to give a 'safe' check wins. By safe check I mean a check that does not result in the immediate capture of the piece as a legal reply. This would rule out any kamikaze attacks by the knights, although if one side decides to "turtle" it may be difficulty to actually win the game. A variant which still seems to have legs is "Three check chess". Three checks are required to win the game, and they can happen at any stage (ie non consecutively is fine). 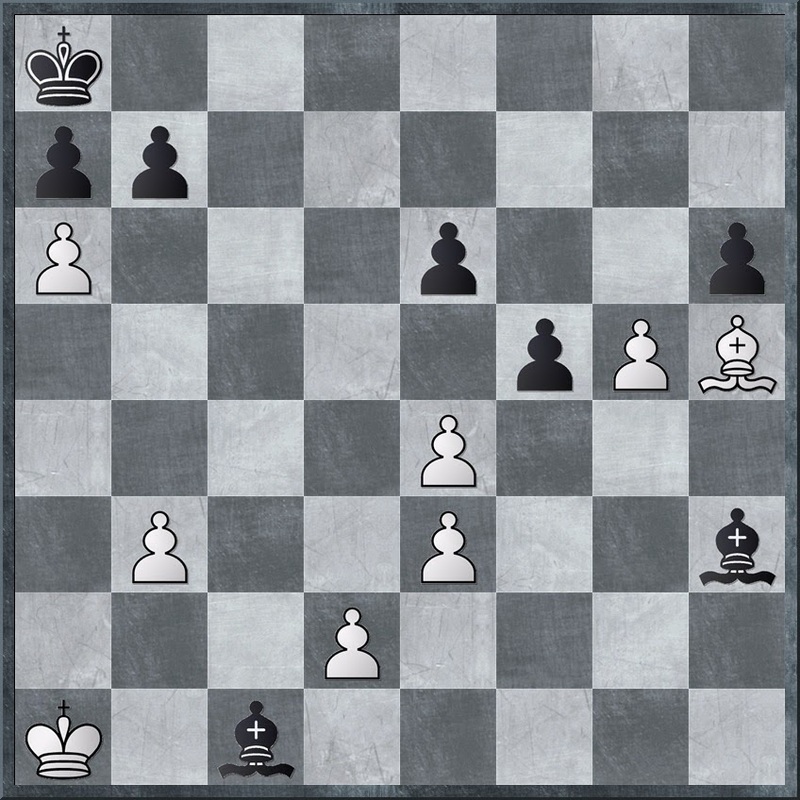 Here is an example game where White goes horribly wrong. 1.e4 e6 2.d4 Bb4+ 3.c3 Bxc3+ 4.Nxc3 Qh4 and Black will play a third check with the queen next move. I suspect that this is the kind of chess variant that might be useful to know if you are embarking on a career as a chess hustler, as it is simple enough to entice the unwary, while giving you an edge if you know what you are doing. In a recent interview former World Champion Vishy Anand said that his "appetite for chess has recovered". Such a statement is not that uprising, as 2014 has been a particularly good year for him. However it is not clear from the interview which came first, the good results or the renewed enthusiasm. The idea that you play chess, even if you don't enjoy it, was first pointed out to me in a book by Reuben Fine that chronicled the lives of the worlds leading players throughout history. Salo Flohr was one of the leading players in the 1930's, but according to Fine, once he reached to top he felt the need to protect his reputation rather than strive for the ultimate prize. As a result he began to play risk free chess, which resulted in fewer losses, but fewer wins as well. And while there was an argument that he could have played in the 1948 World Championship tournament (as a surviving participant of the 1938 AVRO event), he was replaced by Vasilly Smyslov. I can remember thinking at the time that this was a little sad that a promising career was curtailed by the necessity to make a living. Of course the alternative is to do a Morphy or Fischer and just quit, or even a Lasker, taking long breaks from the game. At least in the case of Anand, his lack of passion for the game did not last that long, and he seems the better player for it. A trio of visiting Grandmasters have tied for first on the 2014 Australasian Masters GM tournament, which concluded in Melbourne today. Going into the final round GM Murtas Kazhgaleyev and young Australian IM Anton Smirnov shared the lead on 5.5/8 but Vasily Papin defeated Smirnov in the last round , while Kazhgaleyev drew with IM Moulthun Ly. The win for Papin ended Smirnov's chance of a GM norm, and left him tied with Kazhgaleyev on 6/9. Joining them was GM Rustam Khusnutdinov, who defeated Luke Li. The subsidiary IM tournament was also won by an overseas (although currently living in Australia) player with IM Kanan Izzat proving a convincing winner with 7.5/9. Yi Liu had a good event to tie for second with IM Igor Bjelobrk with 6.5/9. From the 2014 ACT Rapidplay Championship comes the following game. It has a very nineteenth century feel about it, from the choice of opening, the early f4, and the sudden finish! The current World Mind Sports event in China has a number of different styles of chess, including the relatively new format of Basque Chess. In this format players play two games at once, against the same opponent, starting one game with black and the other with white. Players move on either board (when it is their turn), in a similar way to a clock simul. The idea is to cancel out the advantage of having the white pieces in the first game of a 2 game (or 4 or more) match. While this format seems to be new, my knowledge of a similar type of game goes back at least 20 years. FM Craig Laird described to me a 4 (and possibly a 6) board variation of the game, which he said was played at his local club. To make it more fun it was played with a blitz time limit (G/5m) for all games. It was even tried at the Belconnen Chess Club 25 years ago, although the format tended to favour fitter (and taller) players! Adding the extra games did add an extra strategic dimension to the match, as you could afford to abandon a losing position to concentrate on your winning ones. It would not surprise me if it still is a thing in certain chess clubs, although the necessity of having extra equipment may have contributed to its lack of popularity. The traditional end of year ACT Chess tournament, the ACT Rapidplay Championship is being held on Saturday 20th December 2014, in City Walk, Canberra City. It is a 7 round swiss played with a time limit of G/15m. Entries are being taken from 10:30am and the first round is at 11am. Entry fees are $10 ($5 for juniors). The event sponsors are Chicken Gourmet and King O'Malley's and the prize pool is normally over $300. This event is a popular one on the Canberra scene, and provides one last opportunity for chess before Xmas. Normally 30 to 40 players take part in the beautiful outdoor setting in the centre of Canberra, and already a number of strong Canberra players (including at least one IM) have indicated that they will be playing. Entries will be taken on the day, and it the tournament is open to all players. The 2014 London Chess Classic has finished in a 3 way tie for first place. Anand, Kramnik and Giri all scored one win and 4 draws to tie for first on 7 points, using the 3-1-0 scoring system. Anand won the title on countback as his win was scored with the Black pieces. Further down the table Nakamura scored 6 points (+1=3-1) while Adams and Caruana scored 4 points each, although Adam's single win relegated Caruana to last place on countback. Of course it is kind of weird to see the final standings the way they are (at least to me). In this instance the 'football' scoring system did not encourage decisive results, with 66% of the games drawn (NB this is not a comment on the quality of the games). Half the players finished in first place which is another oddity,while the player that lost 3 out of 5 games finished ahead of the player who only lost 1. But rather than point the finger at the scoring system I think this is more a function of the small size of the field, and the limited number of rounds. Unless you have either big round robins (8 players or more) or double rounds (or even quadruple like tournaments of the past), you will get results like this, no matter who you invite. Young Australian player Jack Puccini is representing his country at the Under 16 World Youth Chess Olympiad, currently taking place in Hungary. For the first half of the tournament he has been holding down top board, while IM Ari Dale finished playing in the London Chess Classic FIDE Open. But despite being outrated in almost all his games, he has started the event with 3/4, and is performing at 2400+. Along the way he picked up a brilliancy prize for his destruction of the Serbian Board 1 in round 3. Having published a loss by IM Junta Ikeda yesterday, it is only fair that I publish a win, seeing that today is his birthday. Ikeda, who turns 23, has been a fixture on the Canberra chess scene for over a decade, as well as being one of Australia's rising young talents. He won his first open weekender in 2004 (the Vikings Weekender), and has won a number of major events in Australia and Japan (where he studied for a year). Despite moving to a level where chess study tends to preclude a weekly chess schedule he has continued to support the local Canberra chess scene by playing the Canberra weekend events, the ACT Championships, and other FIDE rated tournaments. Today he showed his resilience as a player, rebounding from yesterdays loss in the Australasian Masters. Facing top seed GM Murtas Kazhgaleyev he started with Larsen's Opening (1.b3) reaching the kind of middlegame he favours. He then began some patient manoeuvring, probing for weakness in his opponents position, until a tactical oversight allowed him to execute a quick attack to end the game. The 2014 Australasian Masters has got off to a combative start, with 70% of the games ending decisively, after 2 completed rounds. The first round was particularly brutal, with no draws happening at all. Unfortunately for the local players, most of the pain has been inflicted on them (and sometimes by them). The notable exception has been IM Anton Smirnov, who is the only player to start with 2 wins. He is followed by a trio of overseas GM's on 1.5, as well as Australian Max Illingworth, who inflicted this beating on Canberra IM Junta Ikeda. Michael Adam's has been one of the worlds top players for the last 25 years, winning his first British Championship in 1989, and qualifying for his first Candidates (PCA) Match in 1993. He has been the top English player for most of that period, with Nigel Short his closest challenger in terms of playing strength. Now in his 40's, he still has the chops to match it with the world's top players. In 2013 he won Dortmund ahead of Kramnik and Caruana, and has finished near the top of most events he has played in recently. His is in the field of the 2014 London Chess Classic and started the event with a win over World No. 2 Fabiano Caruana. The game is a pretty wild one, with Adams sacrificing a piece for a kingside attack. While the sacrifice did not yield immediate dividends, the exposed nature of Caruana's king meant that Adams was able to keep generating threats and prevent Carauana from consolidating. Eventually a heavy piece ending was reached, where Adam's passers counted for more than Caruana's piece, and after some accurate moves at the ened, Adam's scored the full point. For some being a professional chess player would be the ultimate career, for others it may well be a nightmare. One of the worries I would have trying to be a full time chessplayer (apart from lack of ability) is that it would eventually become a boring grind, like almost every other profession. Of course you may be able to change at least some aspects of your day, by changing your regular opponents (by playing simuls or exhibitions) or even deciding to play different openings. I suspect this may have happened a lot in the distant past, with positional players like Rubinstein, Nimzowitsch or even Capablanca trying gambit lines (eg Latvian or Kings) to liven proceedings. The next couple of months look like they will be busy ones for a number of Australian chess players. Apart from the upcoming Australian Open, there is the 2015 Australian Junior Championships (for the younger players) and the 2014 Australasian Masters. This tournament, which has a GM and an IM section, starts on the 13th December, at the Box Hill Chess Club in Melbourne. Both tournaments are 10 player round robins, with GM and IM norms on offer. Top seeds in the GM events are Murtas Kazhgaleyev from Kazakhstan, Vasily Papin from Russia, and Max Illingworth from Australia. Rustam Khusnutdinov is the third overseas GM taking part, while the rest of the field consists of the young guns of Australian chess. At this stage I am not sure which website will be hosting coverage of the tournament, but I am assuming it will be the Box Hill Chess Club website, who covered the event in previous years. The rounds start at 4:00 pm (apart from rounds 2 and 9), and all games will be shown live. The Lidums Young Masters is now in its 4th year as one of the premier junior events in Australia. Interestingly, as the tournament gets older so do the participants, with the age limit pushed up to Under 25 years for this years event. And while the top section remains a closed round robin, the other events have been expanded into swiss tournaments, with the Junior Masters being split into an open and an under 1600 section. Having the top section as a round robin makes sense, as there are very few round robin events held in Australia, junior or otherwise. The downside of this (although I personally don't think it is much of one) is that some players might miss out on either qualifying through strength, or not get invited, due to tournament considerations. If I remember correctly there was a bit of a blow up a couple of years back, when one prominent player did not get invited, resulting in vigorous discussion on various Australian chess forums. The tournament began today, and results are available from the tournament website. You can watch the games from the top section live, although I have yet to find games from the other tournaments. However I was able to get a copy of the round 1 clash between the top 2 seeds, which I can show you here. Young Australian IM Ari Dale is competing in the 2014 London Chess Classic Rapidplay, and his first day was certainly a memorable one. He started the event with 4 wins from 4 games, including a win against one of modern chess' legendary players, GM John Nunn. As a reward for this victory his round 5 opponent was former World Champion Viswanathan Anand. In the game (shown below) Dale played a Gruenfeld against Anand's 1.d4, a particularly gutsy choice as Anand had just had his knowledge of this opening tested by non other than Magnus Carlsen. In fact it turned out to be a good choice, as Dale was equal for most of the game, only coming unstuck when he lost a bishop to a pin down the d file. But having played an international field so far, his opponent for the first round of todays play turns out to be fellow Australian IM John Paul Wallace. If this was Wimbledon, such a match up would not be surprising, but in such a big swiss, so far from home, such pairings are at least amusing. Howard Staunton, English Chess Master, Shakespearean Scholar, illegitimate offspring of nobility, has had a reputation of being a somewhat dour player. I'm not sure whether this reputation is accurate, although there is a notion that he was a 'positional' player, before such things became fashionable. However, when presented with an opportunity he could certainly go the hack. An example of this comes from the London Tournament of 1851. He plays an opening beloved by hackers, the Scotch Gambit, and is happy to surrender a couple of pawns for a lead in development. His opponent then chooses the wrong way to defend and suddenly Staunton is threatening to win material and/or checkmate his opponent. Given that the games in this tournament were untimed, I am a little surprised that his opponent allowed such an elementary checkmate at the end, but it is possible he was simply choosing the 'gentlemen's way out'. The 2014 ACT Junior Chess League's Transfer tournament is on this coming Sunday. This annual event has been running for a decade or so, and always attracts a big field. While most of the players are juniors, the event is open to teams of all ages, with adult teams just as welcome as kindy ones. It is being held at Campbell High School, Trealor Cres, Campbell (just next to the Australian War Memorial). Registration opens at 12:30pm, and the cost is $10 per player (eg $20 per team). As an added incentive, there will be free pizza provided as part of the prize giving ceremony. The standard rules of Transfer (Bughouse) apply, including 'drop for mate'. It normally runs for 11 rounds, and apart from trophies for the winners, there will be additional prizes on offer for whoever the organisers thinks deserve it (oldest team, best parent child, and best team outfit have all been awarded in the past). I am not sure how many schools do this, but Amaroo School gives students a day off school to play in their school's Chess Championship. This has been held for the past 3 years and it normally attracts a field of between 60 and 80 players. In fact it would attract more players, but space an equipment limitations restrict the total number of entries. The 2014 edition was held today, with 66 players taking part. Amaroo is a K-10 school, but entry is restricted to 4th grade and above. While the bulk of the entries came from the 4,5 and 6 graders, there was still a healthy entry from the high school students. My role at the event was the arbiter, and it was one of the easiest school event I have ever run in my 30 years of chess. A lot of the credit must go to Belinda Robertson, and the chess program she has run at the school over the last 6 years. All the students who took part who both familiar with the laws of chess, and more importantly, familiar with how chess tournaments are run. Before we started there was a thought we might only have time for 5 rounds, but due to the knowledgeable field, we played the full 7 rounds by 1pm, leaving plenty of time to pack up and hand out prizes. Rarely for a school event there were no disputes, no one cried, and I only had to answer a couple of queries. I was a little bit gentle with the new FIDE 'Illegal move' loses Rapidplay rules, by implementing a '2 strikes and you're out' system, and even then players had the option of not reporting the first illegal move to me. I did get suckered by one player who innocently asked me if you could mate with K+B v K. Thinking he was about to make a draw claim I said no, but he then used this information to sacrifice his bishop for his opponents last pawn, before claiming the draw! The winner of the event (on countback after a 3 way tie) was Vivian Lam, who also won last year. In fact each of the 3 editions of the championship have been won by a female student, which is another reason it is a rather special event. It might be a long way from Canberra, but the London Chess Classic is still an important event on my radar (and one day I might even get to visit). This year sees the return of the 'classic' tournament, with the main event being a 6 player RR. This years field consists of Caruana, Anand, Nakamura, Giri, Kramnik and Adams. But before they sit down to play chess at long time controls, they are all taking part in the Rapidplay Open that precedes their tournament. There is also a 9 round FIDE Rated Open, a conference on Chess in Schools, and a number of other side events. The best place to find out more information on the event is at the tournament home page. I've spotted a number of Australian players in the entry list (IM John Paul Wallace, IM Ari Dale and Derek Yu) and I am sure a few others might pop up at the last minute. The whole thing runs from the 6th December through to the 14th, and based on the number of entries for the supporting events, it should be a huge success. While Vladimir Kramnik seemed to have a little difficulty in coming to grips with the nuances of the swiss tournament, Anish Giri was more at home in the Qatar Masters, reeling off 6 wins from 6 games. In doing so he has taken a point and a half lead over everyone, with one exception, Vladimir Kramnik. Having drawn his first 2 games, Kramnik has climbed back to the top board after 4 straight wins. This has set up the rather juicy Kramnik v Giri pairing in tonight's round. Kramnik has the white bits for this game, and as I write this they are just getting into a Catalan middle game. I'm not sure what Kramnik thought of the experience of playing in the middle tables of a tournament, but it seems that he wanted to get out of there pretty quickly. An clear example of this was his 5th round game against Sanan Sjugirov. The game only lasted 25 moves and looked like 'hack v hack'. In the end Sjugirov tries to finish of Kramnik with a piece sac, but it turned out that Kramnik was the one with the mating attack. 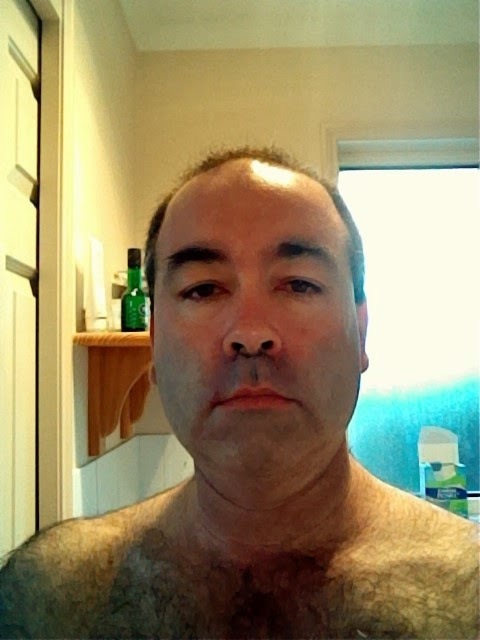 For the last 7 years I have tormented friends and family by participating in the annual Movember fundraiser. If you are unfamiliar with the concept, the idea is to spend November growing a moustache. You start on November 1, and do not shave your upper lip until December 1. This year was a very successful fundraising month for me, with a large number of donations. 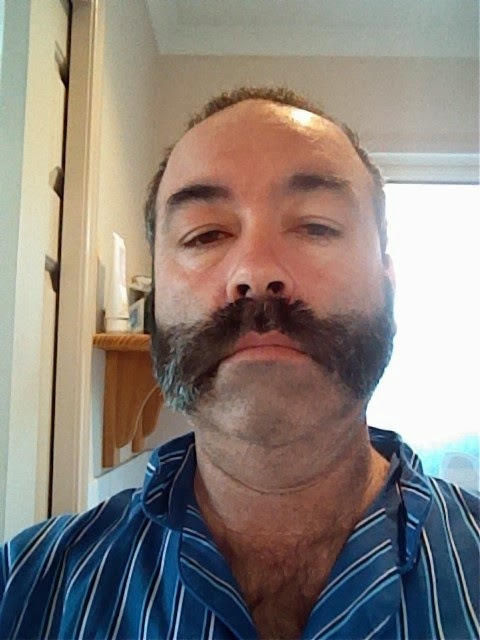 I also managed to grow a mo good enough to make the finals of the Canberra Movember judging, in the Ulti-Mo section. I did not win this year, but next year some creative clothing might be enough to put me over the top. I was not the only chessplayer taking part btw. IM Guy West also took part, and Michael Freeman braved the Northern Territory heat to grow his own tache. But all weird things come to an end, and I spent the morning hacking off my months growth. I wont scare you with the pics taken during my facial hair surgery, but I will give you the classic before and after shots.